Why would you be remotely interested in posting that tweet. "Sorry" is my usual post-coital gambit, not darts. Simple solution for him be a better player and then you might be able to beat him. Statistically speaking, he's more inconsistent, despite the narrower range of averages. But, not as inconsistent by deviation as van den Bergh. Hmm, what about The Mental Machine? And Anderson doesn't seem as consistent as van Gerwen. Edit: Leave this for somewhere more suitable. Last edited by ChrisW on Mon Jan 28, 2019 10:14 am, edited 1 time in total. 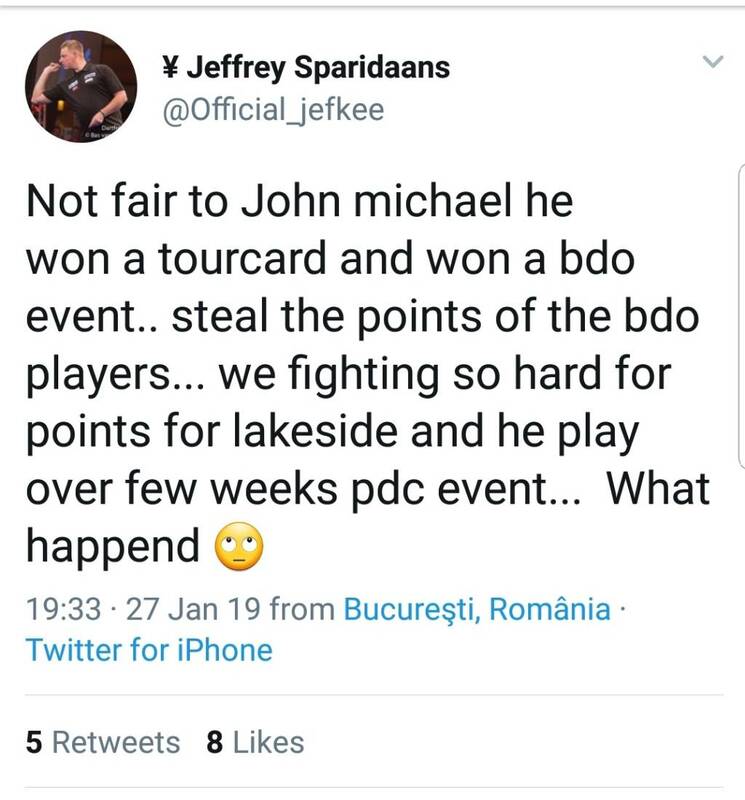 A valid point, when will the PDC open up as the BDO has bravely done? don't they realise that by keeping a few players tied into a restrictive contract is ruining darts in this country. I could never support an organisation that acts in this fashion, it's like they own the freedom of it's players.......... in the old days they used to call this slavery. Clive Woodward hinting about eSports becoming an Olympic sport. I love the Olympics but that thought fills me with dread. That said, i think in Asia the interest would be huge (its the reason why soft tip darts is popular); because they can’t keep their eyes off their smartphones! The IOC have been very deliberate in recent years in aiming for sports that are popular in terms of viewing figures and interest and excitement. Darts would certainly fit the bill, but I don’t think it should become an Olympic sport (yet) simply based on global participation. WADA removed alcohol from the list of banned substances, so maybe darts has a chance. Did anyone see the "Breakdancing Battle" event at the "Youth Olympics". If that's a sport, then my prick's a bloater. If that comes into the real Olympics then sport is dying. Appalling yoof culture shite. They even let soft tip players play in Romania against the pdc lads. This is fascinating to a geek like me, where is this data from?? I just took averages from the year from Darts Database, copied them into a spreadsheet and then used formulae to calculate the values in the table. I exclude (when I remember) the Grand Prix because of the double-in. I do think Jeffrey has a fair point here. I also think Smith-Neale, a jobber of the first order, mocking him is real,cheap. However Jeffrey is at the start of his career and has great potential. The potential to be a top darts player in a five years time. So just keep gaining the experience.